What's the Biggest Ocean on Earth? The Pacific Ocean is the ocean on Earth. True or false? Water boils at 100 degrees Celsius (212 degrees Fahrenheit? What are the two longest rivers in the world called? Name at least one. They are Nile and Amazon. What is the name of the largest marine mammal? It is a whale (blue whale). Is the larger surface of the Earth covered by water or land? The larger surface is covered by water. Around 71% of the Earth’s surface is covered by oceans. And the biggest one is the Pacific Ocean, covering around 30% of our planet’s surface. The blue whale is the largest animal living on Earth. Its length reaches up to 33 meters and weight up to 190 tons. His heart is comparable to the size of a car, and his tongue weighs as much as an adult elephant! Seahorses are the only known animals where the offspring is born by a male. After 14-28 days of pregnancy, up to 2000 small seahorses can come to the world. Unfortunately, only a small part of them survives. An extraordinarily large number of legs is not the only original feature of the octopus. Not everyone knows that their blood is blue and they have three hearts! When dolphins sleep, they have one eye open and rests only one cerebral hemisphere. In this way, during rest, they remain vigilant to threats and possible attacks by predators. It is estimated that jellyfish exist on Earth for about 650 million years. It means that they were here earlier than sharks and even dinosaurs. Sea sponges are living animals, although they do not have a head, mouth, eyes, bone, brain, heart or lung. The European eel is a fish that during its wanderings can sometimes … get out of the water and move on a humid land in a creeping motion. Sea animals coloring pages are fun in discovering the immense space of the underwater world. You might not know that life in the seas and oceans is accessible to us only in a small part and to a large extent, it’s still unexplored. Nevertheless, we already know numerous wonderful animals living out there, such as huge whales, dangerous sharks, beautiful orcs, funny crabs, friendly seals, and their close relatives – walruses. 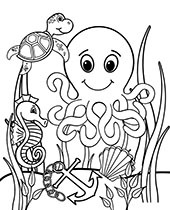 All these creatures are part of the Water World coloring pages, which consist of beautiful coloring sheets for children prepared for immediate printing. And an excellent complement to the fun will be solving the Quiz and reading interesting facts about oceans.